The NFT Network consists of twenty US and international institutions that have committed to assessing their own nitrogen footprints and improving the NFT. There are three cohorts of institutions that have joined between 2014 and 2017. The results calculated by seven institutions in the first cohort have been published in “The Nitrogen Footprint Tool Network: A Multi-Institution Program To Reduce Nitrogen Pollution” by Castner et al. An additional comparison of these results is published in “Comparing Institution Nitrogen Footprints: Metrics for Assessing and Tracking Environmental Impact” by Castner et al. 2017. The average N footprint for the institutions included in the study is 163 metric tons nitrogen (MT N), with 50% attributed to food production and 33% attributed to utilities. The calculated total N footprints for the first cohort range from 7.5 MT N at the Marine Biological Laboratory to 444 MT N at University of Virginia in 2014. These results can be shown by the sectors that are calculated independently for each institution: utilities, transportation, food production, food consumption, fertilizer, and research animals. One metric that allows comparison between these results is the campus population, calculated using AASHE STARS’ full time equivalents methodology and representing the number of full campus users. Institution per capita N footprints range from 7 kg N per person per year at Eastern Mennonite University to 27 kg N per person per year at Dickinson college. The contrast likely relates to both real differences in nitrogen efficiencies, as well as the campus resources allocated per student. For example, Dickinson college provides meals and housing for almost all of its undergraduates, while other institutions do not provide the same level of services. The University of Virginia calculated its nitrogen footprint in 2010 using the original N-Institution model. 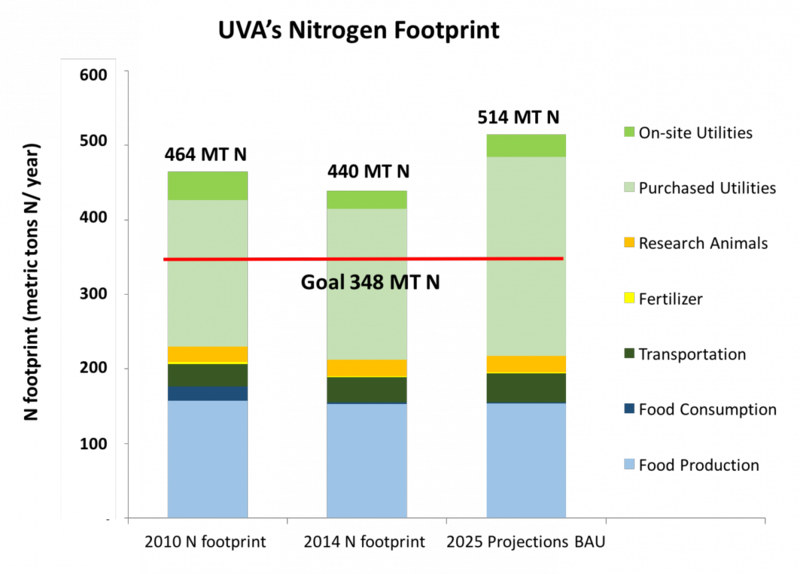 In 2010, UVa activities were responsible for releasing 468 tonnes reactive N to the environment (see pie chart to the right). Almost half of the University's footprint is due to energy use. 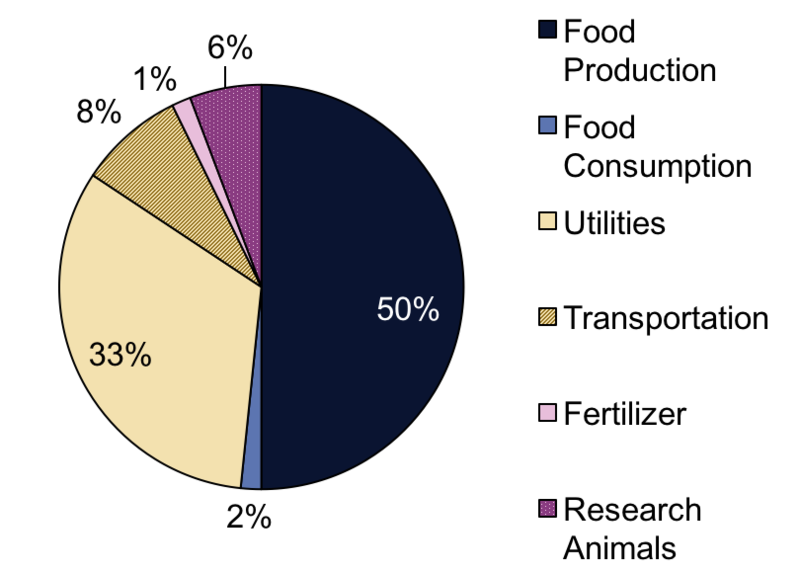 Reductions in the energy sector of the nitrogen footprint will also lead to similar reductions in the institution’s carbon footprint without any additional effort (see below). 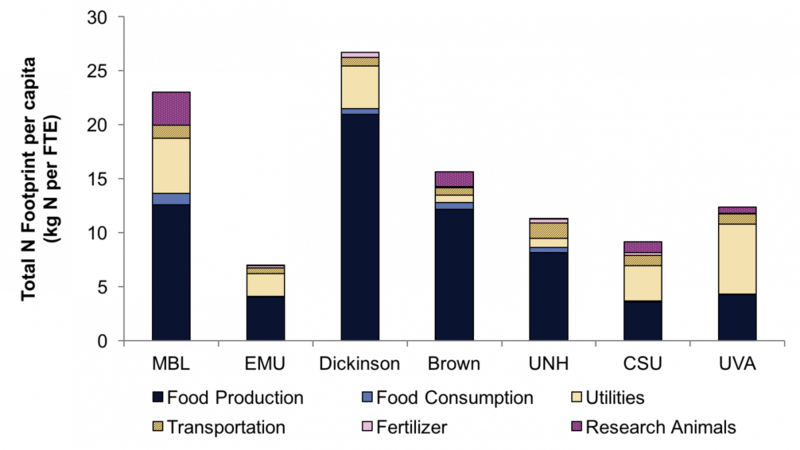 Reactive nitrogen losses from food production and consumption make up the largest section of the institution's nitrogen footprint; this portion of the N footprint can be reduced with changes in food purchasing (e.g., choosing to purchase food from sustainable farms) and food management (e.g., reducing waste and composting any remaining food waste). The institution-level N footprint model (N-Institution) was first developed at the University of Virginia (UVA). Using recommendations from this model, the UVA Board of Visitors established a nitrogen reduction goal: a commitment to reduce both greenhouse gas emissions and reactive nitrogen losses to the environment from the university by 25% below 2009 levels by the year 2025. After the goal was set, the University has continued to track its footprint and completed an updated calculation in 2014. Since 2014 the, UVA has been successful in reducing its N footprint by 5% despite a growing number of new facilities and an increase in student population. 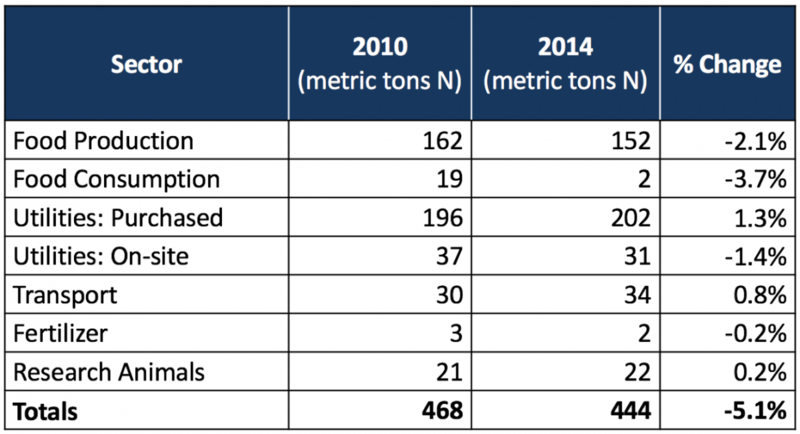 The greatest reduction was in the food consumption sector with a 17 MT N decrease. This was due to improvements in the city of Charlottesville’s wastewater treatment plant. The progress seen is hopeful but further actions will need to be taken in order to reach the 25% reduction goal. 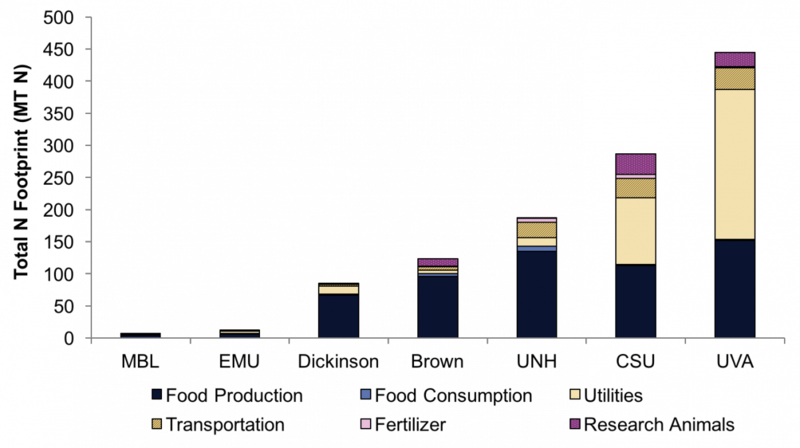 The figure below shows the 2010 footprint, the 2014 calculated footprint, and the projected 2025 footprint under business as usual scenarios. The University of Virginia calculated its nitrogen footprint in 2014 using the original N-Institution model. 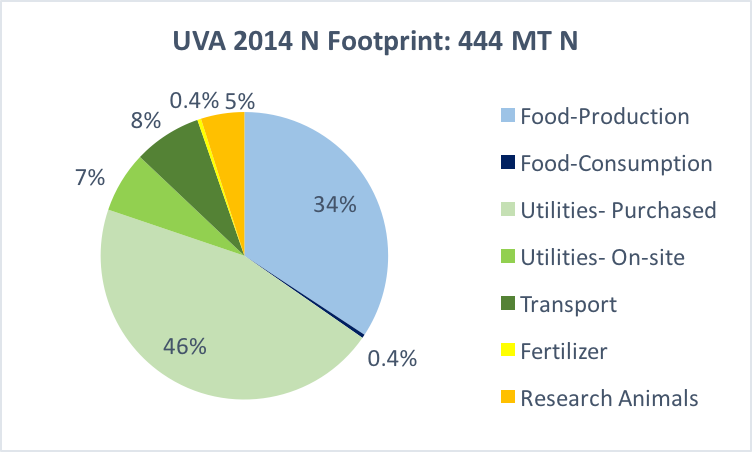 In 2014, UVa activities were responsible for releasing 444 tonnes reactive N to the environment (see pie chart to the right). Almost half of the University's footprint is due to energy use. Reductions in the energy sector of the nitrogen footprint will also lead to similar reductions in the institution’s carbon footprint without any additional effort (see below). Reactive nitrogen losses from food production and consumption make up the largest section of the institution's nitrogen footprint; this portion of the N footprint can be reduced with changes in food purchasing (e.g., choosing to purchase food from sustainable farms) and food management (e.g., reducing waste and composting any remaining food waste). The table below shows the percentage reductions in the University's nitrogen footprint from 2010 to 2014 by specific sectors. In addition to UVA, a first cohort of universities and institutions is currently calculating their nitrogen footprint: Brown University, Colorado State University, Dickinson College, Eastern Mennonite University, the University of New Hampshire, and the Marine Biological Lab. A university nitrogen footprint model template has been developed and will soon be available to other universities upon request. To learn more, please contact the N-Print team at info@n-print.org.